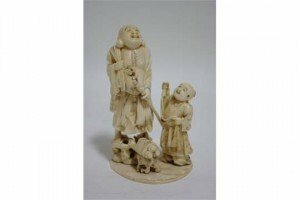 A Japanese carved ivory okimono figure of Hotei standing on a rock, his sack over his shoulder and a staff in his hand, a bundle of scrolls before him, a boy standing at his side; signed to the underside of the flat oval base. 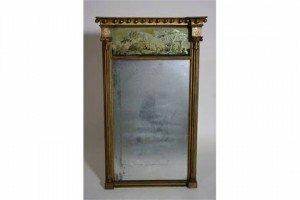 A regency giltwood frame narrow rectangular pier glass mirror, with verre eglomise landscape panel frieze, & with reeded pilasters. 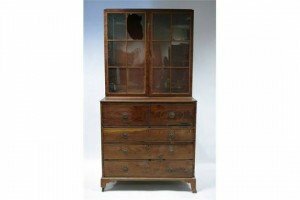 A late 18th century inlaid mahogany secretaire bookcase enclosed pair of glazed doors, with associated cornice, the base fitted three graduated drawers below the secretaire, on splay bracket feet. 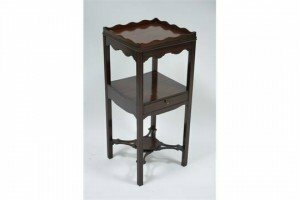 A late 18th century mahogany square basin stand with waved gallery to the top, fitted shallow drawer to the centre tier, & with pierced diagonal stretchers. 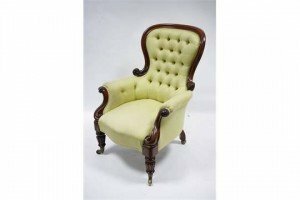 A mid-Victorian carved mahogany armchair with rounded buttoned back, padded scroll arms, & on short turned & reeded tapering legs with ceramic castors. 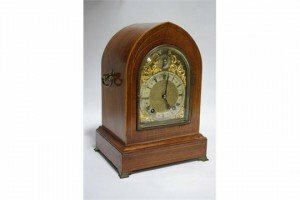 A late 19th/early 20th century mantel clock, the gilt-brass dial with regulator to the arch & with scroll spandrels, eight-day movement striking on a coiled gong, in mahogany lancet case with brass side handles & bracket feet. 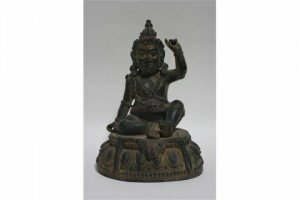 A Tibetan bronze seated Buddhistic figure on oval base, with traces of polychrome decoration. 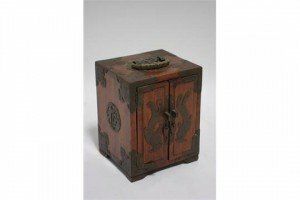 A Chinese hardwood miniature table cabinet with engraved brass mounts, fitted two small drawers enclosed by a pair of panel doors. 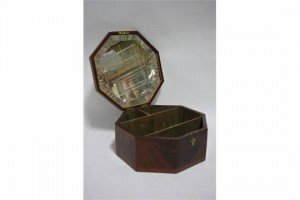 A late 18th century figured mahogany & satinwood cross banded octagonal box with hinged lid inset bevelled mirror to the interior. 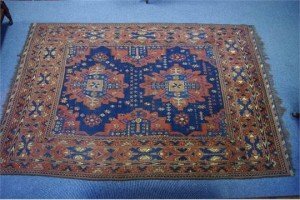 A Persian rug of dark blue ground with repeating multi-coloured lozenge design within multiple borders. 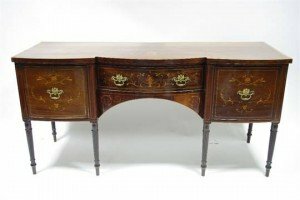 A 19th century inlaid mahogany sideboard with cross banded top & marquetry decoration, the bow-fronted centre fitted frieze drawer, a deep drawer either side, all with cast gilt-brass handles, on six turned & reeded tapering legs. 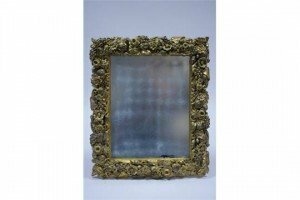 A 19th century giltwood & composition frame rectangular wall mirror decorated with flowers & fruit in high relief. 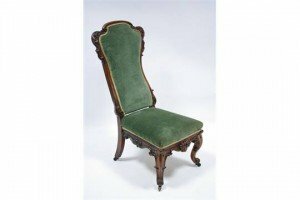 A Victorian carved walnut frame occasional chair with tall padded back & wide padded seat, on carved short cabriole legs with brass castors. 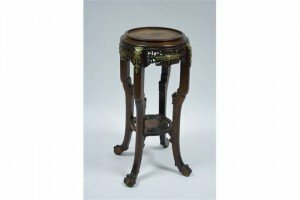 A late 19th century French hardwood jardinière stand in the Chinese style, having circular top with pierced frieze, cast brass mounts & on slender legs with carved paw feet. 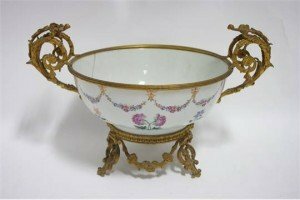 An 18th century Chinese porcelain punch bowl painted with sprays of flowers & swags in famille rose enamels, with 19th century gilt-metal rim, scroll side handles, & pierced base. 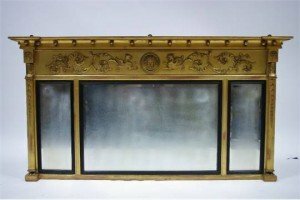 A regency giltwood frame triple panel overmantel mirror, the frieze with relief decoration of gryphons & leaf-scrolls centred by a classical mask, the pilasters with Egyptian masks above pendant bell flowers. 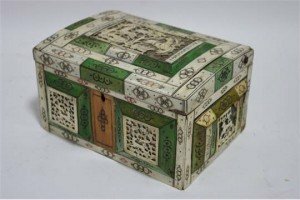 A Russian green-stained & natural bone-veneered rectangular box inset carved & pierced ivory panels depicting various animals. 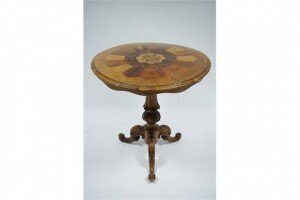 A Victorian walnut tripod table, the circular top veneered with specimen woods, on turned & carved centre column & three carved cabriole legs. 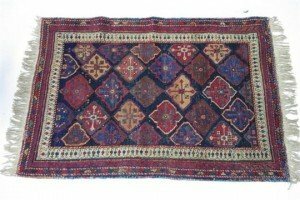 An antique Persian rug with dark blue ground centre, all-over figured with geometric panels & motifs within wide multiple borders. 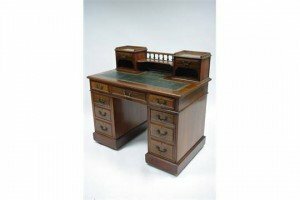 A Victorian mahogany pedestal desk, the stage top with turned gallery, two small drawers, & inset tooled leather top, fitted three frieze drawers below, & three graduated drawers to each pedestal.